If you're looking for an unforgettable sport-adventure, there's no better machine than the new V-Strom 1000 Adventure. With sleek side and top cases that are large enough to hold a full coverage helmet, it takes versatility to a new level. It boasts the same exceptional performance as the original V-Strom 1000, with a Suzuki fuel-injected, 90 degree V-twin engine tuned for incredible low-end and mid-range torque. It also has a lightweight chassis and advanced suspension to provide crisp handling even on tight back roads. 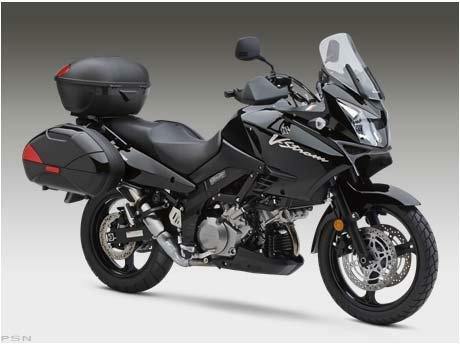 When you reach the open highway, the V-Strom 1000 Adventure excels. Its smooth engine performance, aerodynamic windshield and ergonomic riding position make it one of the finest sport-touring machines available. With the Suzuki V-Strom 1000 Adventure, Sport-adventure is yours for the taking. Multi-reflector 60W / 55W headlights. 996 cc Liquid-cooled, Suzuki fuel-injected, 90 degree V-twin engine with four valves per cylinder, dual-overhead cams and oil provides exceptional low-end and mid-range torque for exhilarating performance. Large, stylish side and top cases. Height-adjustable windshield for increased wind protection and comfort can be adjusted to three positions in a 50 mm vertical range, work together with hand guards designed for maximum wind protection.